Humboldt Brewing might not be a name you immediately recognize but when I mention Hemp Ale you might. Humboldt Brewing was one of (if not the) the first breweries to make a hemp-based beer. While Humboldt Brewing was purchased by Firestone Walker and their name changed to Nectar Ales they still continued making their Hemp Ale, they later changed their name back to Humboldt Brewing earlier this year. 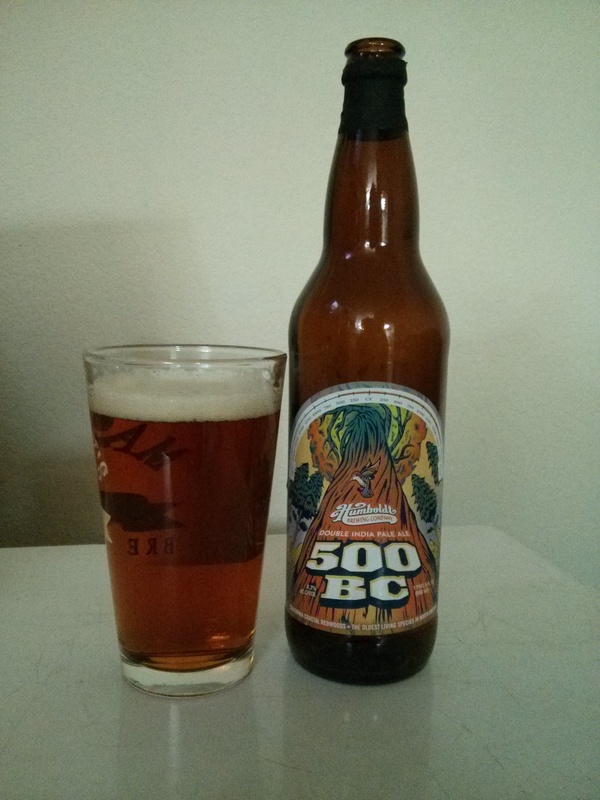 Humboldt released a new this year called 500 B.C., a double IPA which you can find on draft as well as in 22-ounce bottles. 500 B.C. poured an amber-orange color, very vibrant and clear. It had a white, foamy head that died down a bit but kept its lacing around the glass and a tin layer on top of the beer for a good hour. Upon the first whiff you get hit with a lot of hops, I swirled and aerated the beer a bit and it gave off more citrus aromas and earthy notes like pine and resin. The first taste is extremely sweet and reminiscent of birch syrup, which would be fitting since the beer label is centered around a tree (California Redwood to be more exact, which is what the beer name is related to). 500 B.C. is perfectly carbonated, the beer has a nice bite to it while drinking but does not deter from the flavor. You do get the sweetness balanced out by the large amount of hops in this beer, but their flavor is spread throughout the tasting experience. You get a slight amount of hops in the beginning, more in the middle, and then it closes out the sip with more hops. But 500 B.C. is not a hop-bomb by any means, the malts counter-balance the bitterness. Humboldt has outdone themselves and 500 B.C. is one phenomenal beer, we highly recommend seeking it out if you are able to.